A collaborative effort by Ubisoft Montreal and SpectreVision, Transference is a brief dive into the mind of brilliant but troubled Dr. Raymond Hayes, whose research explores the idea of consciousness and what reality truly is. If that’s not strange enough for you, don’t worry, the game makes up for it as soon as you boot it up. Depositing you outside a low-rise apartment building, the player – who takes on the role of an unnamed observer, stumbling upon Hayes’ work – explores the unit within, finding out every detail about the good doctor and his family. It’s a somewhat sad tale, as you soon discover that the Hayes are not the image of familial bliss one might expect from a couple and their young son. One of the more interesting aspects of Transference is that it blurs the line not only between realities within the game, but that it attempts to do so outside of the game as well. The player is frequently subjected to clips of real actors within gameplay, as a television might turn on, or a computer screen will activate, playing a real recording of ‘Raymond Hayes’, speaking to the observer. 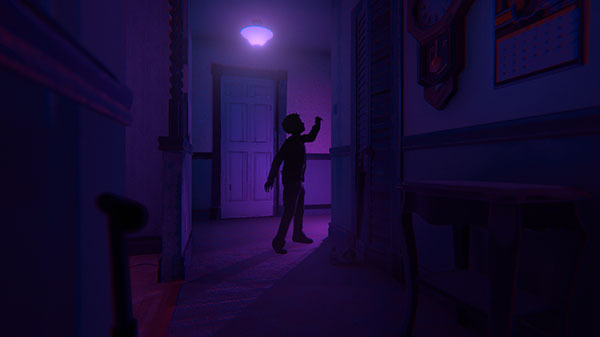 As the game progresses, it becomes apparent that the player is interacting with three different realities – Raymond’s own reality, as well as those of Benjamin (his son), and Katherine (his wife). Within these realities are subtle clues, all of which can be interacted with, though they have different meanings to the different players. For example, a set of handcuffs in Katherine’s reality that bore the inscription ‘To Katherine, Love Raymond’ had me thinking this couple was a little more adventurous than otherwise implied; in Ray’s reality, they’re a set of wedding rings, which carries a sadder meaning. One of the game’s most interesting mechanics is how the observer shifts between realities – there are a handful of light switches around the apartment, and flicking them sends you to another viewpoint. That’s a huge part of the game – perhaps you might see an empty room in one reality, but in another, it’s occupied by the objects you need to venture through. At every important turn, the observer is hounded by a monster of some sort, a black mass of corrupted data, a sign that the experiment perhaps did not turn out well after all. The atmosphere is fantastic, as everything about it – the voice work, the ambient noises, the little brief snippets of sound that happen when you interact with an object – is well done. The attention to detail is impressive, from examining musical sheets to picking up a library card to checking voicemails on the answering machine (who knew those still existed?). Over the course of the game, the observer slowly watches Raymond descend into madness, and it’s reflected not only in his own reality, but in those of his wife and son, as well. At the end of it all, there are some pretty dark implications for the Hayes family, which entices you on further whenever possible. Unfortunately, Transference has some pretty clunky mechanics. You can’t move faster than an ambling walk, meaning that it takes forever to get from one side of the apartment to another. If you missed a clue – some of which can be so small, they’re almost impossible to see on a first glance – then it can take quite a while to move on from the room you’re stuck in. There was a point towards the end of the game where I was struggling to find the next clue, and essentially started clicking on every object in the room to find it – not very intuitive. The narrative’s ending, too, goes out more with a whimper than a bang, which was disappointing. Transference really reminds me of a halfway decent horror movie – one where there are a few jump scares, and a couple of standout moments, along with some impressive visuals and attention to detail. Unfortunately, also like such movies, by the time you get near the end, you find yourself checking your watch, wondering when it’s going to be over. Transference is available now on Microsoft Windows PC, PlayStation 4, and Xbox One. A code was provided to Okay, Cool by Ubisoft for review purposes. You can also find Sho on social media in this reality at @SNSAlli. Or maybe that’s the other reality? We forget.